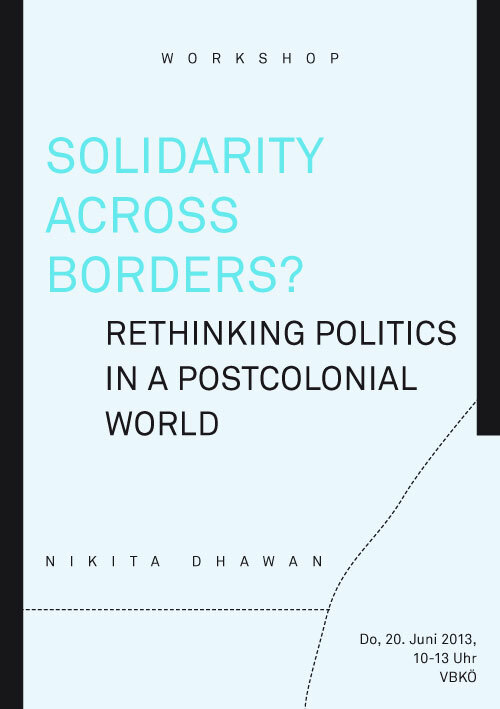 In recent discussions on transnationalism, there has been increasing focus on the principle of cosmopolitanism as hope for ’solidarity across borders’. In the face of growing global interdependence, the project of cosmopolitanism promises to facilitate a transnational citizen’s movement, which could potentially galvanize the establishment of democratic global institutions, creating space for transnational political discourse. Against this background, the workshop will critically engage with the discourses of global gender justice, development politics, human rights, decolonisation and democratisation from a feminist-postcolonial perspective. Auf Wunsch kann der einführende Text „Zwischen Empire und Empower: Dekolonisierung und Demokratisierung“ (Dhawan 2009) zur Vorbereitung verschickt werden. Am 20. Juni 2013 findet zudem der Vortrag “The Empire Prays Back: Religion, Secularity and Queer Critique” im Rahmen der Ringvorlesung “Biopolitiken aus queer-feministischer und postkolonialer Perspektive” um 19h im Hörsaal B am Campus (AAKH) statt. In Kooperation mit der Universität Wien und der Akademie der bildenden Künst Wien.